The ultimate aesthetic brace choice. 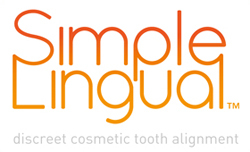 Simple Lingual uses brackets positioned on the inside of the mouth to gently move and align the front 4-6 teeth, for those patients where speed and appearance are essential. Because they are placed on the back of the teeth they are virtually unnoticeable from the outside. Your teeth can be straightened without worrying about your appearance.